March 2, 2019 -- Disease detection with CT has benefited greatly from advancements in artificial intelligence (AI) software during the past year. 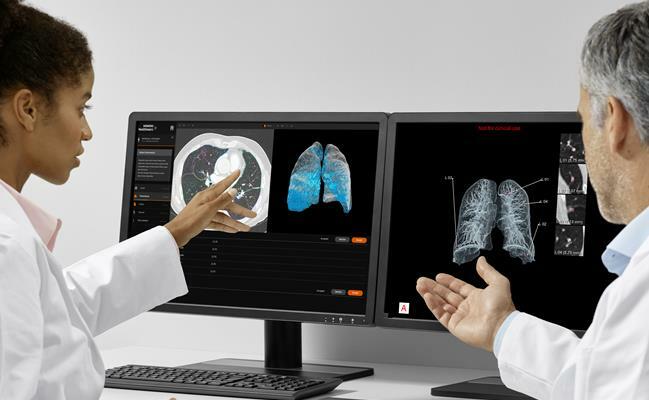 To make the case at the ECR 2019 technical exhibition, many vendors are dedicating their CT booth presentations to the integration of AI into the modality. The rewards for patient care are visible for all delegates to see during this week's congress. 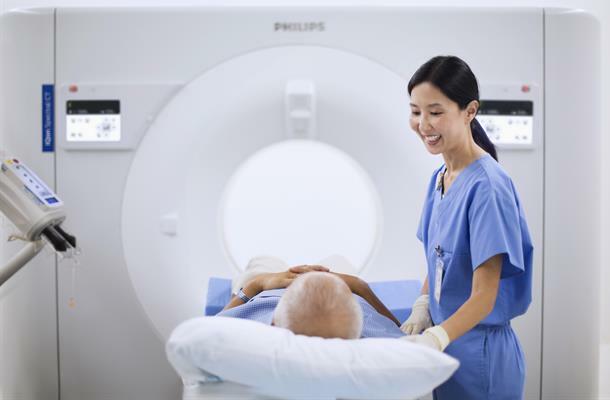 With its gaze set firmly on combining AI and CT to enhance care, Siemens Healthineers is highlighting its AI-Rad Companion Chest CT, a software assistant for radiology powered by AI technology. Chest CT scan viewed with the AI-Rad Companion Chest CT software. Image courtesy of Siemens Healthineers. This product is reportedly the company's first application capable of using AI algorithms to automatically differentiate individual structures on chest CT scans. The algorithms can highlight distinct structures in the thorax and also spot potential abnormalities. The application's various tasks include detecting lung lesions, determining cardiovascular risk based on CT coronary artery calcification, measuring the diameter of the aorta, and segmenting individual spinal vertebrae for bone density and fracture analysis. To round out its offerings, the application can automatically generate a standardized quantitative report of the data. Whereas radiologists generally center their CT interpretations around the primary indication, AI-Rad Companion Chest CT performs a systematic and equal examination of all areas of the chest, potentially finding lesions in regions that the reader may not have made a priority, according to Siemens. Clinicians can incorporate the product into existing clinical workflows, with all scans and supporting information automatically available in PACS through the vendor's cloud-based teamplay infrastructure. The vendor-neutral application is suitable for use with data from any CT machine and is currently offered on a pay-per-use basis. It will be available in U.S. and European markets in the spring of 2019. The Revolution Apex CT scanner. Image courtesy of GE Healthcare. GE Healthcare is featuring the latest addition to its Revolution line of CT scanners, Revolution Apex. As a next-generation intelligent CT scanner, Apex enlists GE's Edison deep-learning image reconstruction algorithm to assemble what the company refers to as TrueFidelity images, which are marked by high spatial resolution, natural-looking texture, and low-contrast detectability. These images can help boost radiologists' confidence in diagnosing clinical cases, according to the company. Revolution Apex is also equipped with a new imaging chain and the Quantix 160 x-ray tube. The components are collectively designed to improve temporal resolution and coverage, as well as provide spectral capability. As a result, the CT scanner can deliver whole-organ coverage, including for patients with elevated heart rates, high body mass index, and compromised renal function, among other conditions. Keeping in step with previous Revolution CT scanners, Apex produces high-resolution images while maintaining low radiation doses during scanning, GE noted. The company is featuring its Edison reconstruction technology as a work-in-progress. Aquilion Precision ultrahelical CT scan (0.25 mm x 160 detector rows) of the left knee, performed with FIRST. Global Illumination 3D volume rendering demonstrates exostoses. Image courtesy of Canon Medical Systems. Making its first mark in AI-driven CT scanning, Canon Medical Systems is introducing its Advanced Intelligent Clear-IQ Engine (AiCE) deep learning-based image reconstruction technique. The product can reconstruct low-quality, low-dose CT data into high-quality images. Applying AI to CT reconstruction permits the use of low radiation dose (on the same level as conventional CT scans) without compromising final image quality, according to the company. The images compare to those reconstructed using the company's forward-projected model-based iterative reconstruction solution (FIRST). The AiCE algorithm is compatible with the Aquilion One Genesis CT and Aquilion Precision ultrahigh-resolution CT scanners. Together with AiCE, these systems enable high-spatial resolution CT scan reconstruction between three to five times more quickly than the current gold standard of using model-based iterative reconstruction, Canon noted. The increased reconstruction speed of up to 40 images per second is possible because of the scanners' Nvidia graphics processing unit boards. In the case of Aquilion Precision, activating AiCE for scanning results in sharp images with a resolution of 0.25 mm and a 1024 x 1024 imaging matrix, compared with the 0.5-mm resolution and 512 x 512 imaging matrix of standard CT. Canon is awaiting regulatory clearance for the technique. Meanwhile, Philips Healthcare is highlighting the financial advantages of using its IQon Elite spectral CT scanner. Multiple studies have demonstrated the technology's capacity to increase workflow efficiency in hospitals by reducing the occurrence of follow-up scanning, lowering levels of contrast agent and x-ray radiation dose, and accelerating the time to diagnosis, according to the company. The IQon Elite scanner is designed to improve workflow and reduce follow-up imaging. Image courtesy of Philips Healthcare. "The IQon Elite Spectral CT is the first detector-based spectral CT of its kind to deliver more confident patient diagnoses in the first scan, representing a revolution in CT performance," said Kees Wesdorp, business leader of diagnostic imaging at Philips. Notable features of the scanner include reconstruction speeds reaching approximately 200 CT examinations per day, radiation therapy planning couch and bariatric tabletop for larger patients, and the ability to estimate electron density for tissue characterization. Hitachi is showcasing its Scenaria View CT scanner at ECR 2019. Offering both 64- and 128-slice scanning, the device boasts a larger 80-cm aperture, a lateral shift table with up to 10 cm of adjustment, and an iterative dose-reduction function. 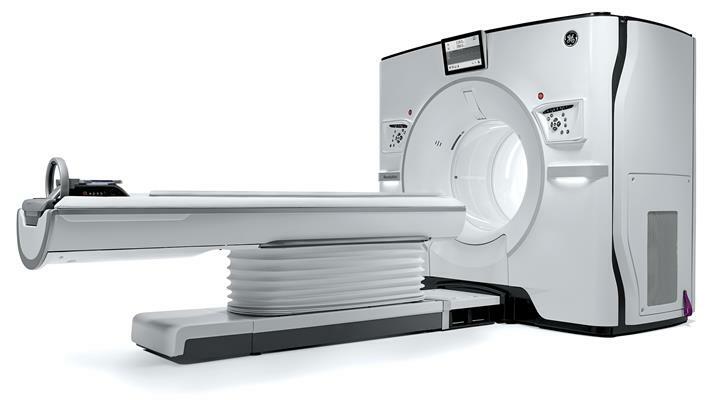 The scanner's open design enables it to accommodate large-sized patients, the vendor noted. Hitachi is also promoting its Supria family of CT scanners, prized for its scalability (16 to 64 slices) and high-speed scanning (less than 1 sec per rotation). 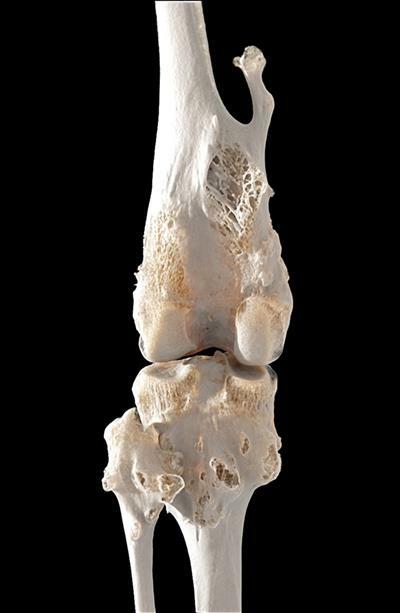 Carestream Health is displaying its OnSight 3D extremity CT scanner, which allows for point-of- care, weight-bearing imaging examinations of the upper and lower extremities. The conebeam CT scanner produces high-resolution 2D and 3D images that may help reveal subtle or occult fractures, the company noted. Its wide opening and capability of 3D adjustment for height, tilt, and rotation also make for easy patient access. In addition, the unit includes an advanced scatter and metal-artifact correction algorithm that can be upgraded to second-generation software for further improvements to visibility. Fujifilm Medical Systems is reserving the CT section of its booth for the FCT Speedia and FCT Speedia HD CT scanners. On display is a 64-slice version of the whole-body scanner, equipped with a console that embeds Synapse 3D-reconstruction modules. The manufacturer is also highlighting its FCT Pixel Shine, which uses AI algorithms to make efficient image processing viable at extremely low radiation doses, the company noted. Originally published in ECR Today on 2 March 2019.